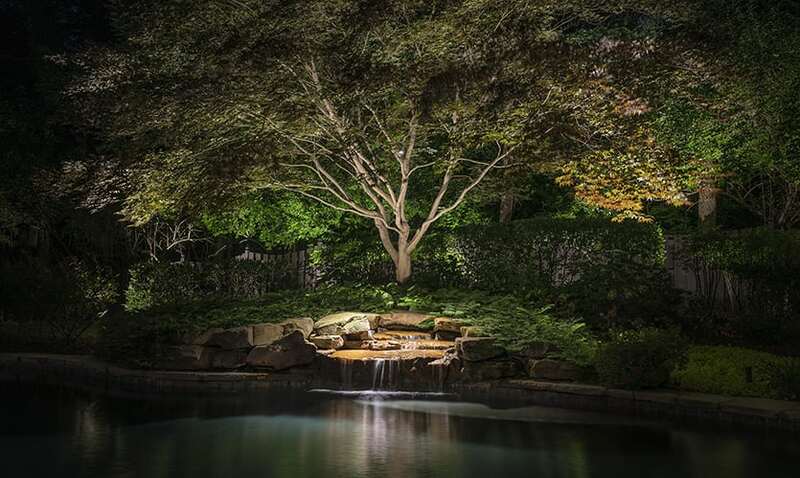 In an illuminated landscape at night, trees are by far the most popular of subjects within the garden space and reign as the supreme sentinels of the landscape. The great thing about trees is that they come in all different forms, sizes and colors, which adds a tremendous amount of variety to the lighting palette. Some trees are small and particularly ornamental, which makes them perfect for areas where homeowners and guests can interact and view them more intimately. Very large sentinel trees generally grace the periphery of the garden spaces, to create what is seemingly the living walls of our outdoor rooms. In the context of favorite trees, it is very difficult to narrow it down to just a few selections. Here are some of our favorite types and why we love lighting them so much. Flowering trees such as Eastern Redbuds, Ornamental Pears, Cherries and Crabapples, sit high up on our list of favorites because of the variety of color and drama we get from these wonders of nature throughout the year. In the winter, the leafless trees reveal an elegant and often symmetrical structure that begs to be seen in the starkness of the lifeless cold season. By spring, new life emerges once again in an explosion of flowers that range from pinks, reds, golds, whites and virtually every color in-between. Many of these flowering trees will experience leaf color changes throughout the seasons which adds even more interest and drama to these garden beauties. Topiaries and ornamentals are generally classified and known by their small size, unique growth habits or interesting texture and color. These are generally smaller plant specimens that are placed closer to a walkway or front door, so they can be seen and appreciated much more easily. 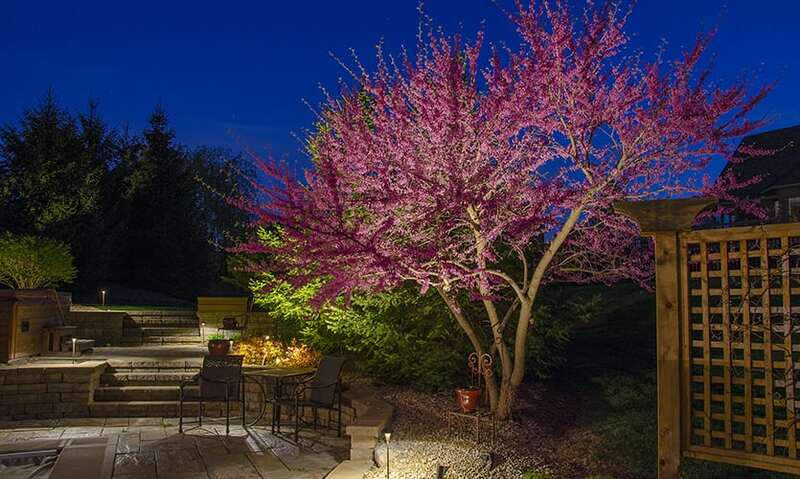 These ornamental trees are fun to illuminate because they become almost a piece of living art at night when they become the center of attention. 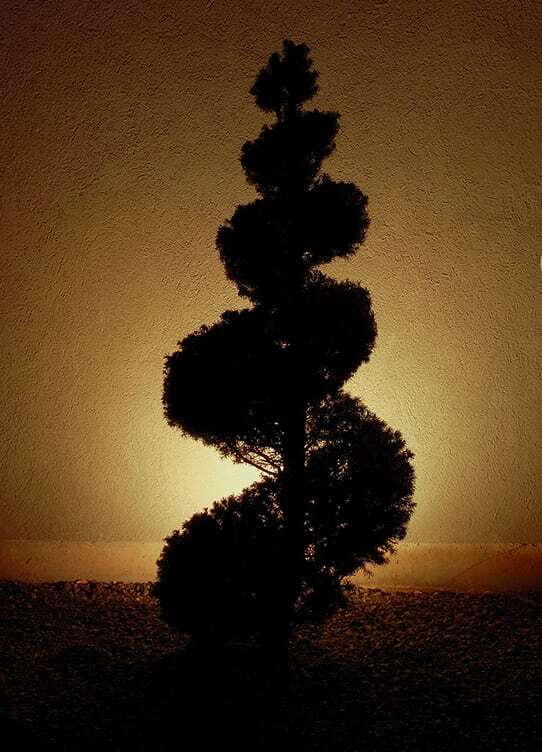 For sculpted topiaries, we often consider back lighting to create a silhouette of the form of the tree. This technique can be very striking against a smooth, monochromatic wall such as stucco or light-colored brick. There is something so appealing about the unique character of a well-manicured Japanese maple tree, which is probably why they have become one of the most commercially propagated and hybridized trees on the planet today. You can’t pass by too many houses in America without seeing at least one or two forms of these trees gracing garden spaces. Upright Japanese maple trees have beautiful, open branch structures within the middle of the tree giving them an open and airy feeling. The leaves of these maples are often very delicate and colorful as well. Combine these two assets and you have one perfect specimen tree for taking center stage at night. In the spring, many of the newly emerging leaves are translucent, so when shining a light up through the branches from underneath the tree, the visual is a tranquilly soft green glow or shockingly red highlights. These are wonderful trees all around and one of our perennial favorites to showcase. Nothing says “resort” or warm-season living like the graceful palm tree. Some of my best memories are of stepping off a plane in the middle of a hard, northern winter, to being greeted by warm southern temperatures and gently swaying palm trees off in the distance. Palm trees come in a variety of shapes, heights and colors. Their spiky forms make them perfect for placing an exclamation point in the middle of a garden bed of soft colorful foliage. 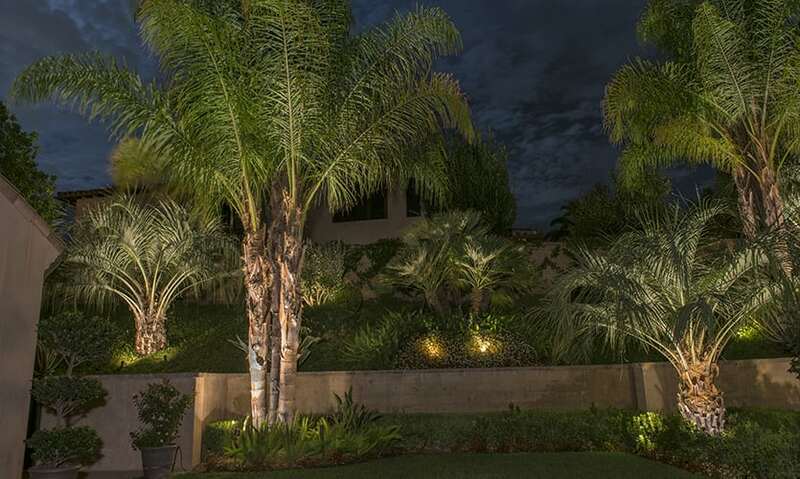 Within the garden, palm trees scream for attention and are generally situated where they will be displayed prominently. This makes them a natural candidate for lighting. 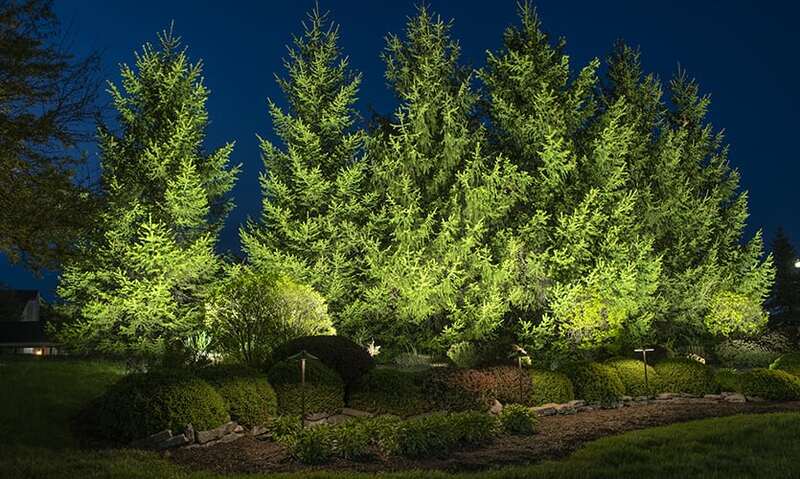 We use narrow beams on our LED lamps to send grazing light up the smooth trunks of these trees to bring their fan shaped fronds to life after dark. Evergreen trees rarely get the respect they deserve. Throughout the spring and summer season, they tend to take a back seat to other garden stars that offer more flash. However, once winter sets in and the deciduous trees go dormant for the season, these garden mainstays become the primary interest in the garden spaces. Evergreens vary from stiff needled conifers in the north such as spruce and fir, to soft-needled varieties in the southern states such as Cypress, Pines and Cedars. Evergreens come in a variety shapes, colors and forms that present wonderful lighting opportunities to create stunning shapes and backbone garden features that persist year around.